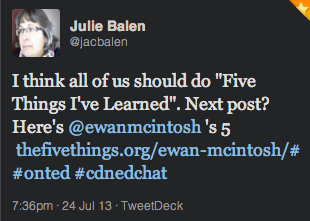 Two days ago, Julie Balen issued this challenge to her PLN. The idea was to follow the example provided by Ewan McIntosh, and share things we have learned along our journeys. If this had to be perfect, I would never get it posted. The fact it has taken two days shows that I still struggle with this. School teaches us to “do our best”, and “high marks win”, and I was SO good at that game. So good, that I forgot to stop playing when I got out. I spent a lot of years as a teacher, staying up all night, working on perfect lesson plans and perfect worksheets (ugh!). I would argue that there are still times when you need to plan, edit and polish over and over because the stakes are high. But in the normal course of your working day, time drags you along, ready or not, to your commitments, and you won’t be perfectly prepared for all of them. And that’s okay. When I started taking my Principal Qualification Program from Ontario Principal’s Council (OPC), we were told to arrive at our first class with a copy of our written statement of our philosophy of education. My very wise instructor (Ardeth Gorden) told us that she didn’t want to read them, but that we should read them, revise them and know them. Because, she said, you will have to make so many decisions where you weigh all the different positions, viewpoints and consequences, and still there is no clear solution or path. That is when you will have to go to what you believe, to your philosophy of education, to make a choice. I have learned that it must be more than what you believe. It must be what you know to be true through research, it must be evidence-based, and transparent. Those affected by the decision should be able to predict the outcome before you make it because they know you and know your bottom line. For me, as for most Principals, it was always based on what was best for students. Not long after I started as Principal at my last school, teachers would come into my office and begin with, “I know you won’t agree with this, but…”. They knew where I stood, but they also knew that I would listen to a good, evidence-based argument. Two summers ago, while visiting us at the lake, my nephew began to develop some odd and troubling health symptoms. A few months later, he was diagnosed with an aggressive form of ALS, and last Christmas, he passed away. Every single time I think I am too afraid to do something, I remember that I may not get another chance. Being a Principal is tough work. You face challenging realities and emotional confrontations all the time. You must be prepared to make snap decisions that affect people deeply. You have to do the right thing, even though it may scare you. I was fortunate in my first year as a lone Principal to have a supportive group of teachers to work with. Miss Wallwin (@wallwins) is famous for her bulletin boards with “courage quotes” in the back hall of the school. Before doing anything that scared me, I would “do the walk” – one lap of the building, read some courage quotes, and head back to face what needed to be done. We all face our fears in different ways, but we don’t get anywhere by letting them control us. It’s all about relationships. Taking time to build them is time well spent. It’s about being connected and being a learner. Last year I was invited to have a “conversation” with a Dean of a Faculty of Education. We were “exploring” the possibility of having me teach the Principal Qualification Course for them. He asked me about how I do my job, and when I started talking about my PLN, his eyes began to glaze over. I can remember the exact moment that I lost him. Four days later I received a phone call that he had asked someone else to teach the course. I model connected learning for teachers and students. I am writing this sentence because of connected learning. I learn 24/7 from my Professional Learning Network. At one time I would have told you that these relationships do not have to be face to face. I still believe that to be true, but I know now that some f2f contact can greatly enhance the relationship. I have met so many amazing educators f2f through conferences, and my best investment: Unplug’d12. Whenever I travel, I try to find members of my Twitter PLN and catch up to them in person. It strengthens our work together and helps enhance our learning together online. This is new learning for me. My Latin teacher once wrote in my Yearbook: “To a lovely young lady, but oh how stubborn!”. He nailed it. I have spent a lot of my life chasing things that were not going to be caught, yet I didn’t know when to give up. My favourite Pausch quote is one I share often. But lately I have realized that I am pretty good at climbing walls, and not as good at recognizing when I have climbed too hard or too long. I know now that it is also important to know when to stop, before there is no energy left to go on. Sometimes we need to stop, to climb down, to realize we have done our best and some things are not going to change. After a pause to refresh, it’s time to find another pathway around the brick wall. These are five things I have learned recently. There are many more. How about you? Can you share five things you have learned?